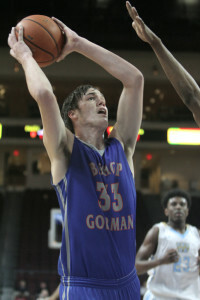 When it comes to frustrating ways to lose a game, Bishop Gorman may have set the standard Friday night at the Orleans Arena. The Gaels (8-3) lost to Oklahoma power Putnam City West, 52-50, in overtime in the semifinals of the Platinum Division of the Tarkanian Classic when sophomore guard Nick Robinson’s layup barely beat the buzzer. Robinson’s game-winner came after Gorman, which converted four turnovers into just three points in the final 91 seconds, failed to capitalize on a Richie Thornton steal near mid-court with about 12 seconds to go and the score tied at 50-50. Thornton deflected the ball to guard Nick Blair who drove to the basket but missed an off-balanced shot with five seconds left. Forward Dedrian Parmer then got the rebound for Patriots and passed it out to guard Tyson Jolly. Jolly, who finished with a game-high 24 points, appeared at first that he might pull up and heave a half-court shot. Instead he rifled a pass to Robinson racing in from the right wing, and the 6-foot-3 sophomore barely beat the horn for the winning basket. Blair finished with a team-high 14 points for the Gaels while Stephen Zimmerman and Ugo Amadi added 13 points each. Putnam City West (7-0), ranked No. 4 in the nation in the MaxPreps Freeman Rankings this week, will face sourthern California power Redondo Union in the Platinum title game Saturday at 5 p.m. at Bishop Gorman. The Gaels, meanwhile, will face Corona (Calif.) Centennial at 3:40 in the third place game. 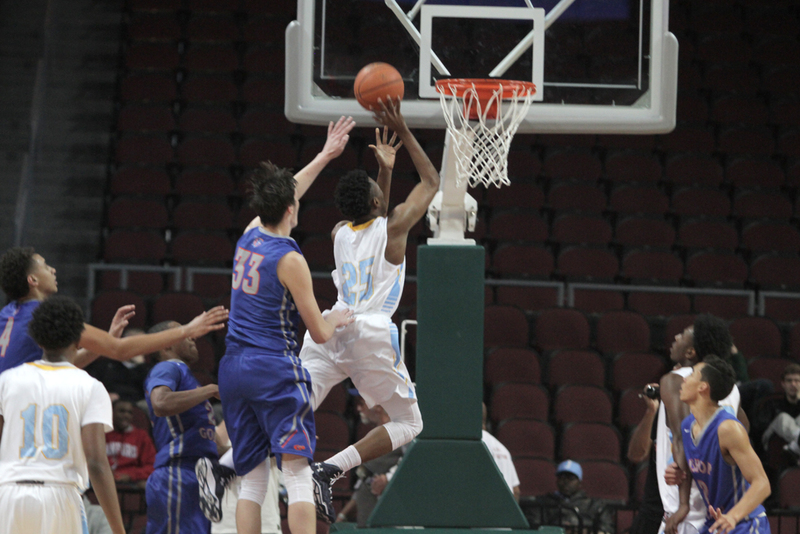 It was a much better outcome for southern Nevada’s other heavyweight team, Findlay Prep. The Pilots (12-0) overcame a sluggish start to roll past National Prep Academy from Stockridge, Ga., 79-51. Junior swingman Justin Jackson, a verbal commit to UNLV, led the way with a game-high 27 points and several dazzling passes while Arizona-bound shooting guard Allonzo Trier finished with 17 points and senior forward Horace Spencer III added 15 points.